The early morning lights of Luna Park, Sydney. Spending only a half a day in Sydney, viewing the amazing port from the ship and driving through the city to the airport gave us a perception that it is truly an amazing city. 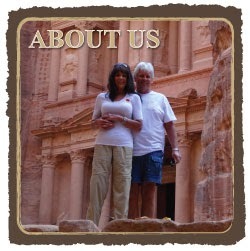 We'll be returning and staying overnight on several occasions as we board more cruises to tour this amazing continent. Australians spend a lifetime scouring this vast continent never feeling they've even scratched the surface. Australia compared to the size of the US is nearly as big. Our perception may have been its a large island. From this map, its evident that not the case and its vastness and wilderness is unique in many ways as we'll illustrate over the next many months. As the world's sixth largest country after Canada, Russia, China. USA and Brazil, its size exceeded our perceptions of years past. For us, as visitors for so little time, we'd decided cruising around the country would give us a better opportunity to explore its many major states and cities. At some point, down the road during gaps in our schedule we may decide to rent a "caravan" (an RV) to further explore the mysterious barren Outback which intrigues both of us. Even the glow of the ship against the backdrop of the beautiful harbor was appealing. For now, we've moved into our Trinity Beach home for the next three months and as soon as it stops raining, we'll begin taking endless photos of the exquisite beauty surrounding us. The property is exactly as shown in the photos and the owners, Sylvie and Andy, living quietly above us, are even more charming than expected. It couldn't be more desirable. Photos to come tomorrow. Getting here was challenging. We were exhausted and hungry after a long 12 hour travel day. But we always recall the 36 hour travel days to Africa to remind ourselves how short these less trying days can be comparatively. Buildings line up along the shore. On the way from the airport to Trinity Beach we stopped at Woolworth's grocery store to buy bottled water, cream, roasted chickens and salad for dinner. We hadn't had a bite all day and needed quick sustenance. The store was much more well stocked than we'd expected and today we'll return to do the first big shopping. Renting the car was somewhat of a fiasco when our prepaid reservation was missing which finally they found after considerable time and effort. They rented us the our usual smallish vehicle some Mazda model into which our luggage manages to fit. There's no doubt that Sydney is one of the most beautiful port cities in the world. We've always heard about the Harbour Bridge but had no idea how impressive it would be in person. With the rush over the past few days, we had little opportunity to elaborate on our final cruise expenses. Here they are in detail including the cruise fare. Our usual average cost per day when living in rentals, paying for rental cars, groceries, tours, dining out and miscellaneous is approximately US $200, AUD $257.97. By cruising, as opposed to flying, which may have been as much as US $3000, AUD $3871.12 we really didn't pay much more at approximately an extra US $86, AUD $110.97 per day than our usual living costs. Another view of the famous Sydney Opera House. For the extra difference, the extraordinary experience made it well worth the expenditure. We're pleasantly shocked by these numbers. We'll be back tomorrow with photos of our new home as we wait for the rain and cloudy skies to clear. You won't be disappointed. Nor are we! We drove to the village of Boa Morte to check out the scenery. For details, please click here. We never thought we'd have view comparable to those in Madeira but we're beginning to think that the views here in Trinity Beach may compare. For details, please click here. Welcome "home"! Glad you made it safely. Staci, my dear, how sweet of you. Oddly, we are so comfortable already it does feel like home, even after only minutes on the ground. The warmth and familiarity given to us by those 1400 Aussie passengers was the perfect intro to their homeland and we feel welcomed with open arms. Hope you and Glenn are well and planning your next trip.